D.A. 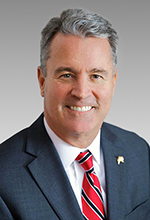 Davidson Companies has named Mark Davis, Senior Vice President, Director of Private Trust Development, as the 2019 recipient of the Bragg Lewis Knutson Community Service Award. Given in recognition of outstanding volunteer efforts, the award is the highest honor bestowed upon a D.A. Davidson associate. Mark has demonstrated a deep commitment to several causes. He is President of the Seattle Philanthropic Advisors Network, an organization that he co-founded in 2008 and that is in the process of expanding to other major cities. For 32 years, Mark has been a dedicated member and leader of the Rotary Club of Seattle. Even when traveling, he attends meetings in other cities and so has never missed a weekly meeting. By serving in several leadership positions, he has provided extensive hands-on work within the Seattle chapter. He was a founding board member of Teens in Public Service in Seattle. He is an active member of the Issaquah Village Theater and has been involved, with the rest of his family, in Up With People. Mark is the 24th recipient of the Bragg Lewis Knutson award, which is named for three D.A. Davidson executives who were active in community and professional service. We applaud Mark for his dedication and commitment to creating positive change.